This year he scored a career-best 18 goals, along with 33 points in 36 games for Tech. His four game-winners was tied for 18th and six power play goals was tied for 21st entering this weekend’s NCAA tournament (Tech is not in the tournament). 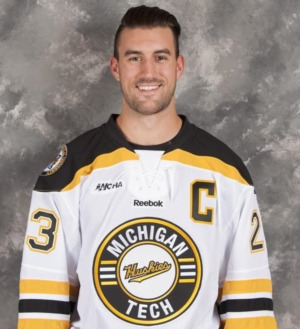 His production and leadership was a big reason that Michigan Tech won their first WCHA championship since 1976 this season. This leadership and Goal scoring prowess will be a key factor in coaching players at our PEHS 2016 PEHS Hockey Schools. Alex played for the Iowa Wild for the remainder of the season.